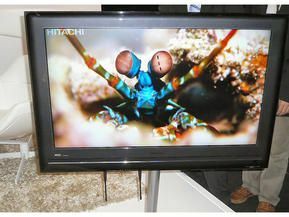 Following on from Sony’s launch of the 3mm thick XEL-1 OLED TV in Japan, Hitachi has thrown down the gauntlet in Europe by announcing the imminent arrival of its so-called Wooo range of slimline TVs. Well, Hitachi isn’t actually going to describe any of the models in its new range specifically as a TV, as none of them feature an on-board TV tuner. Quite what it will call them isn’t yet clear. However, with a suitable set-top box and an HDMI cable, they are all perfectly able to function as TVs. The omission of a tuner is just one of many space-saving and size-reducing measures taken by Hitachi. The on-board power supply has been downsized by 33 per cent too, a move that allows for a much thinner screen overall. Cnet reports that in Japan the Wooo range is available in a range of colours, including white. Hitachi has also confirmed that the Woo will be available for European markets in three ascending sizes of 32, 37 and 42-inches. The 32-inch, 720p MH70 will arrive in April, priced £1,145. The 1080p, 37-inch 37MX70 will arrive in May and cost £1,900. Meanwhile, the 42-inch, 1080p 42MX70 will arrive in June and cost approximately £2,290.